It is (wait for it) a mid-century modern. Yippee! This house is an extensive remodel of a 1948 postwar cottage, with the goal of retaining the flavor of the original structure, but bringing the outdoors in. Doesn't get more mid-century than that? Let's see how they did. First the fabulous deck overlooking the garden property. This was an add-on but flows seamlessly with the house. Architect for the project is Public Architecture and Planning who also did the Munson Residence on the tour. This remodel takes the character of the existing home from 1948 and expands it. A series of pavilions are linked together by a trellised walkway and garden spaces creating a tightly composed site plan which provides a simultaneous indoor-outdoor experience. and enter a cozy retreat. The door leads to a separate master bath and laundry room. I like that! Multi-functional and not shy about making rooms work very hard. Extremely mid-century. Super industrial room with the washer/dryer. And surprise! The master shower is literally an indoor/outdoor shower (channel Rob Lowe from Parks and Rec). But cool. You like it, right? No ceiling. And no mechanism to close the ceiling. The owner gets rained on when it rains. But as she pointed out to a tour taker, she was already wet at that point. Time to leave this glorious bedroom. You go back to the main house through the kitchen. The living room is a typical long narrow room from the 50's (and I think they made it longer as part of the remodel). I brake for green glass. Note how the big beam runs lengthwise at the top and the white wall stops below the beams. The owner told me that the ceiling was removed to create this open space. What we are seeing are the supporting structures put in place after the walls came down. I am a sucker for pretty flowers. Owner left such a charming scene, just ready for a photograph. Nice work! Towards the back of the long room, is a media room with traditional mid-century furniture and a shoji screen to block out the TV watchers from the rest of the house. Shoji screen on the right. This is the original front door to the home. I like the pistachio paint (also original). It is cool that the homeowner deliberately left in original touches. Guest bath. I tend to go overboard on the bathroom pictures. Look at this stonework. Awesome. We saw some of this in the outdoor shower. Pretty shelf setup. And very functional. Another shot of the tub because I can't help myself, right? Ms. Kathryn Harris, the homeowner, strikes me as a very practical, yet stylish gal. Okay, I have saved the best for second to last. The kitchen. I am sorry, but this home wins the "kitchen most likely to make a woman cry" award. Wait for it. That butcher block island is so nice for sitting around, cooking, or a late night game of poker. What a great layout, with plenty of elbow room. Two cooks could work in here easily. There are cabinets, drawers and cupboards for days. And ovens for days. Warming, roasting, microwaving. I couldn't quite figure it out. The counter-top is a practical Ceaserstone (which I am partial to) in a grey color (good idea). No granite here. I love a little mid-century pottery displayed on open shelving. A little blurry but I had to include the cappuccino machine. Seriously. And the farm house sink. She wasn't messing around. Okay last one and then I'll quit. Let's wrap this up! Most excellent central patio. Kitchen to left and master bedroom to right. One of the favorite features of my home has always been the relationship between the outside and inside. Now I love how the inside space has a view of the landscaping at every point, truly bringing the outside in. I feel that the house that exists today is the house that is meant to be here. This is a fire feature waiting for it's welded grate, not a seat, and equipped with wood storage below. View from the back. You finally see more of the crowd milling about. The house sits on a lovely piece of land with beautifully tended gardens and a bit of a slope. It is charming. People from Southern California don't even know what this is. Of course, it's an outside entrance to a spooky basement! Because the owner converted the garage to a bedroom, she built herself a pretty slick little carport. My son wonders if all her boxes get wet. He is thinking about our garage. It has boxes instead of cars. The retaining wall for the driveway carried a message. Big things come in small packages. At 2,300-square-feet, this home is comfortable but modest. And very mid-century. More details about the project on the Dwell site. And the Harris Residence wraps up the San Deigo Modern Dwell Home Tours for me. The Dwell Tours are well run events and worth the price ($75 per day). Check out all the houses in the Related Posts below with the last post being all ten house on the tour. 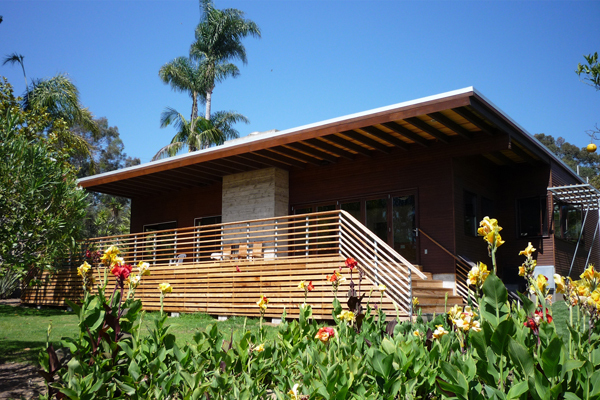 Next Dwell Home Tour will be in Los Angeles, June 2013. Count me in. How similar are 21st century modern and mid-century modern? i'm reminded of how different the climate considerations are where i live [anchorage, AK] vs southern california. we would never bury rooms that used to have sun exposure with a roofed addition [open air or not... probably not] in a place where a nice summer day tops out at 65 degrees, the record high of all time is 83, and no houses are equipped with AC... in fact we have a lot of spaces where gigantic south and/or west facing windows open up to a view, and interior spaces and decks are oriented to catch every bit of daylight, not be shielded from it. Welcome Clark! Yes, Southern California is very different than Alaska. An outdoor shower must be somewhat shocking to you. So different, the open doors and windows? The bedroom suite was such a surprise and a clever solution to adding a master suite onto what must have been quite a tiny house. So much about this house that I like...but I'm absolutely in love with the showers! Dana I thought this would be the one for you. Yes, the showers. Fabulous. *The 'rugged' concrete seat is a fire feature waiting for it's welded grate, not a seat, and equipped with wood storage below. The 'pistachio' door is the original front door & color to the house. Thanks so much! Corrected! What a beautiful home. Thanks you for the note! Corrected! You have a beautiful home. And the remodel is exquisite. I've been enjoying your home tour photos! Gosh, the last home tour I went on was in Marin - and you were not ALLOWED to take pictures - yeesh! This home is my absolute favorite. Love the wood ceiling, and the industrial look touches. Damn, wish we could have afforded Miele appliances! Curious about the range, did it have a pop up hood? Thanks, the tour homes were great! Professional cameras were only allowed for Media and you had to wear a badge clearly identifying yourself as Media. But I noticed that regular folks had smaller cameras and were taking lots of pictures as well. It appears that there is a fan near the stove in the last photo of the kitchen (in the countertop). This house has an impeccable kitchen.